Beautiful sleek design which looks great on any vanity unit – Detachable top section allows you the flexibility to create your own storage solutions. Compact but with generous capacity to store your items such as jewellery & cosmetics. Makes a great gift. 16 slot upper section and 4 drawer bottom compartment with round pearl style drawer knobs. Beauty Cosmetic Organiser Display Stand made from sturdy durable clear acrylic. Sleek and beautifully designed to display on your bedroom dresser, vanity unit or anywhere in your home. The organiser allows you to easily see the contents helping the selection process. The drawers smoothly slide out and each drawer can be used to organise different items – earrings, necklaces, bracelets, rings, brooches, and other accessories. The drawers keep your items dust free. Can also be an excellent chest for storing makeup as well as small craft items, sewing notions, etc! 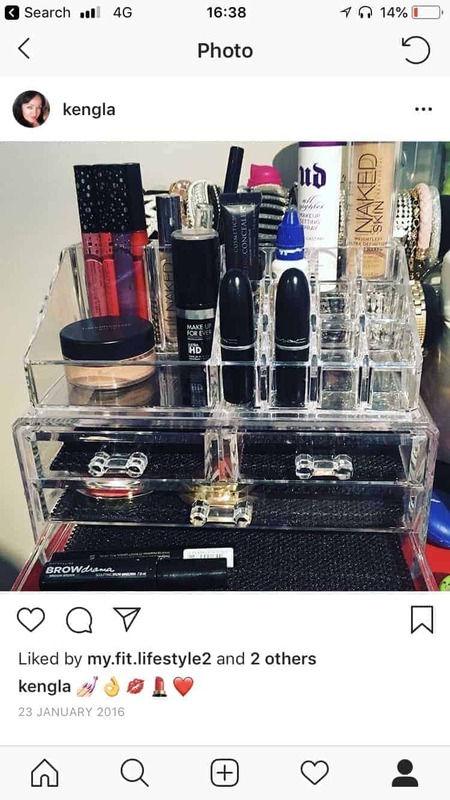 I have two of these in my bedroom to keep my makeup organised. Keeps things within easy reach and look pretty.